Everybody who can knit knows how to knit garter stitch. 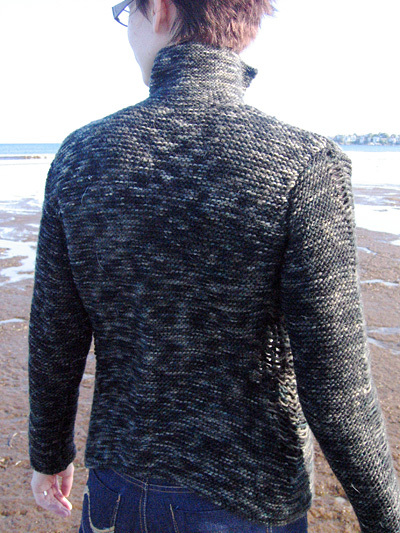 When conceiving this jacket, my aim was to pare down design elements to the most basic: the knit stitch, basic increases and decreases, and dropped stitches. The result is a punk aesthetic that remains adaptable to all manner of personal styles. 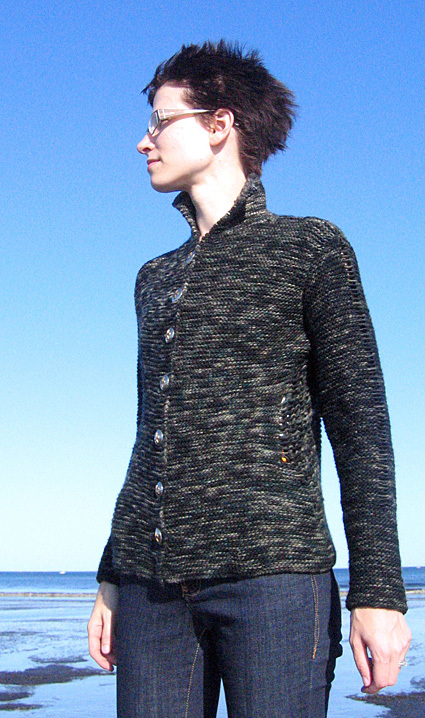 You will not purl a stitch when making this jacket. If you’ve never knit a sweater, you can knit this one and enjoy every minute. 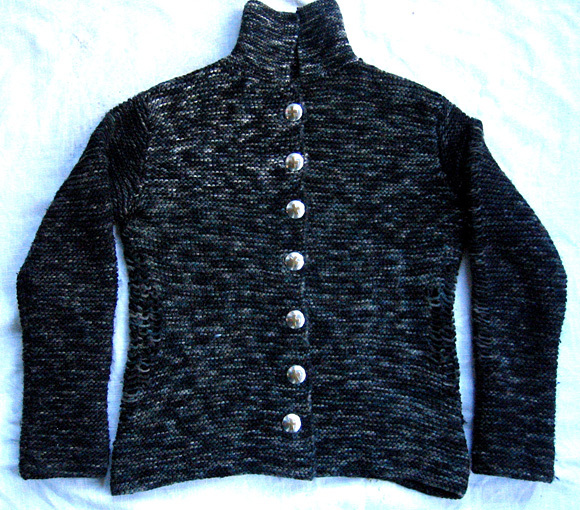 Note: This pattern was designed as a jacket to be worn over layers and fit with 3-4 inches of ease. The model shown has a 32 inch bust and is wearing a size S (finished bust measurement of 35 inches). 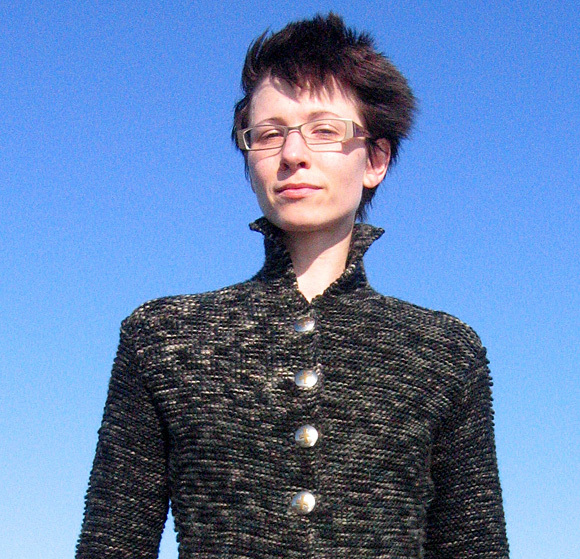 To make a more fitted jacket, knit a size that's closer to your actual bust measurement. Good substitute yarns would be Manos del Uruguay worsted-weight wool or Malabrigo worsted merino. Approx. 1000[1160, 1560, 1850, 2100, 2280, 2380, 2500]yd / 914[1061, 1426, 1692, 1920, 2085, 2176, 2286]m are needed. Directions for the Backward Loop Cast On can be found here. Drop/pick up next st: Drop next st and allow column of sts to unravel several rows. Pick up and k the st you have dropped by inserting left needle from back to front under horizontal strand of yarn formed by dropped st, and knitting through front of loop. Later on, finish unraveling column of sts down to base of dropped st column. K all rows, both RS and WS. Note: You may find it helpful to place a safety pin or split ring marker in the work to indicate RS. Using larger needle, CO 158[175, 194, 211, 227, 246, 263, 282] sts. Do not join. Set-up Row [RS]: K44[48, 53, 57, 61, 66, 70, 75], place marker, 70[79, 88, 97, 105, 114, 123, 132], place marker, k44[48, 53, 57, 61, 66, 70, 75]. Markers indicate side “seam” placement. Buttonhole Row 1 [RS]: K4, BO 2 sts, k to end. Buttonhole Row 2 [WS]: K to bound off sts, CO 2 sts using backward loop method, k4. Continue in garter st until work measures 3[3, 3.5, 3.5, 3, 3, 3.5, 3.5] inches, ending with a WS row. Row 1 [RS]: K to 3 sts before first marker, ssk, BO next st, slip marker, k2tog, k to 2 sts before next marker, ssk, slip marker, BO next st, k2tog, k to end. Row 2 [WS]: [K to bound off st, CO 1 st using backward loop method] twice, k to end. 154[171, 190, 207, 223, 242, 259, 278] sts. Rows 3-10: K all sts. Row 11 [RS]: K to 5 sts before first marker, ssk, BO next st, k3, BO next st, k2tog, k to 4 sts before next marker, ssk, BO next st, k3, BO next st, k2tog, k to end. Row 12 [WS]: [K to bound off st, CO 1 st using backward loop method] four times, k to end. 150[167, 186, 203, 219, 238, 255, 274] sts. Rows 13-20: K all sts. Row 21 [RS]: K to 7 sts before first marker, ssk, BO next st, k7, BO next st, k2tog, k to 6 sts before next marker, ssk, BO next st, k7, BO next st, k2tog, k to end. Row 22 [WS]: Work as for Row 12. 146[163, 182, 199, 215, 234, 251, 270] sts. Rows 23-30: K all sts. Row 31 [RS]: K to 9 sts before first marker, ssk, BO next st, k11, BO next st, k2tog, k to 8 sts before next marker, ssk, BO next st, k11, BO next st, k2tog, k to end. Row 32 [WS]: Work as for Row 12. 142[159, 178, 195, 211, 230, 247, 266] sts. Rows 33-40: K all sts. Row 41 [RS]: K to 11 sts before first marker, ssk, BO next st, k15, BO next st, k2tog, k to 10 sts before next marker, ssk, BO next st, k15, BO next st, k2tog, k to end. Row 42 [WS]: Work as for Row 12. -[-, -, -, 207, 226, 243, 262] sts. Work 16[16, 16, 16, 8, 8, 8, 8] rows in pattern. Note: See Pattern Notes for directions for “drop/pick up next st”. Next Row [RS]: K to 10 sts before first marker, kfb, drop/pick up next st, k15, drop/pick up next st, kfb, k to 9 sts before next marker, kfb, drop/pick up next st, k15, drop/pick up next st, kfb, k to end. -[-, -, -, 211, 230, 247, 266] sts. K 9 rows. Proceed to Row 1 for All Sizes, below. Row 1 [RS]: K to 8 sts before first marker, kfb, drop/pick up next st, k11, drop/pick up next st, kfb, k to 7 sts before next marker, kfb, drop/pick up next st, k11, drop/pick up next st, kfb, k to end. 146[163, 182, 199, 215, 234, 251, 270] sts. Rows 2-10: K all sts. Row 11 [RS]: K to 6 sts before first marker, kfb, drop/pick up next st, k7, drop/pick up next st, kfb, k to 5 sts before next marker, kfb, drop/pick up next st, k7, drop/pick up next st, kfb, k to end. 150[167, 186, 203, 219, 238, 255, 274] sts. Row 12-20: K all sts. Row 21 [RS]: K to 4 sts before first marker, kfb, drop/pick up next st, k3, drop/pick up next st, kfb, k to 3 sts before next marker, kfb, drop/pick up next st, k3, drop/pick up next st, kfb, k to end. 154[171, 190, 207, 223, 242, 259, 278] sts. Rows 22-30: K all sts. Row 31 [RS]: K to 2 sts before first marker, kfb, drop/pick up next st, slip marker, kfb, k to 1 st before next marker, kfb, slip marker, drop/pick up next st, kfb, k to end. 158[175, 194, 211, 227, 246, 263, 282] sts. Continue in pattern until work measures 16[16.5, 17, 17, 17, 17, 17, 17] inches, ending with a WS row. Remove markers when working next row. Next Row [RS]: [K to 5[5, 5, 5, 6, 6, 6, 7] sts before marker, BO next 10[10, 10, 10, 12, 12, 12, 14] sts] twice, k to end. 39[43, 48, 52, 55, 60, 64, 68] sts remain for each front; 60[69, 78, 87, 93, 102, 111, 118] sts for back. Next Row [WS]: K to first set of bound off sts; place remaining sts on hold on spare needle. Next Row [RS]: BO 3 sts, k to end. 36[40, 45, 49, 52, 57, 61, 65] sts. Next Row [RS]: K2tog, k to end. Repeat these 2 rows 0[2, 1, 4, 5, 5, 5, 7] times more. 35[37, 43, 44, 46, 51, 55, 57] sts. Work in garter st until work measures 6[6.5, 7, 7.5, 8, 8.5, 9, 9.5] inches from beginning of armhole, ending with a RS row. Note: Shoulder shaping begins on Row 12. Row 1 [WS]: BO 6[8, 8, 8, 10, 9, 12, 12] sts, k to end. 29[29, 35, 36, 36, 42, 43, 45] sts. Even-Numbered Rows 2-10	[RS]: K all sts. Row 3 [WS]: BO 4[4, 5, 5, 5, 6, 6, 6] sts, k to end. 25[25, 30, 31, 31, 36, 37, 39] sts. Row 5 [WS]: Work as for Row 3. 21[21, 25, 26, 26, 30, 31, 33] sts. Rows 7, 9, 11 [WS]: K2tog, k to end. When Row 11 is complete, 18[18, 22, 23, 23, 27, 28, 30] sts remain. Row 12 [RS]: BO 6[6, 7, 7, 7, 8, 8, 9] sts, k to end. 12[12, 15, 16, 16, 19, 20, 21] sts. Row 13 [WS]: K all sts. Rows 14-15: Work as for Rows 12-13. BO remaining 6[6, 8, 9, 9, 11, 12, 12] sts. Place 60[69, 78, 87, 93, 102, 111, 118] held sts of back on needle with WS facing and rejoin yarn. BO 3 sts at beginning of next 2 rows. 54[63, 72, 81, 87, 96, 105, 112] sts. Repeat this row 1[5, 3, 9, 11, 11, 11, 15] times more. 52[57, 68, 71, 75, 84, 93, 96] sts. Work in garter st until work measures 6.5[7, 7.5, 8, 8.5, 9, 9.5, 10] inches from beginning of armhole, ending with a WS row. Next Row [RS]: K20[20, 24, 25, 25, 29, 30, 32] and place these sts on hold on smaller needle; BO next 12[17, 20, 21, 25, 26, 33, 32] sts, k to end. 20[20, 24, 25, 25, 29, 30, 32] sts. Row 1 [WS]: K all sts. Row 2 [RS]: K2tog, k to end. Rows 3-4: Work as for Rows 1-2. 18[18, 22, 23, 23, 27, 28, 30] sts. Row 5 [WS]: BO 6[6, 7, 7, 7, 8, 8, 9] sts, k to end. 12[12, 15, 16, 16, 19, 20, 21] sts. Row 6 [RS]: K to end. Rows 7-8: Work as for Rows 5-6. Place held sts of right shoulder on larger needle with WS facing and rejoin yarn. Row 1 [WS]: K2tog, k to end. Row 5 [WS]: K all sts. Row 6 [RS]: BO 6[6, 7, 7, 7, 8, 8, 9] sts, k to end. 12[12, 15, 16, 16, 19, 20, 21] sts. Row 7 [WS]: K to end. Rows 8-9: Work as for Rows 6-7. Place held sts of right front on needle with WS facing and rejoin yarn. Continuing to work buttonholes as set, work right front as follows. Next Row [WS]: BO 3 sts, k to end. 36[40, 45, 49, 52, 57, 61, 65] sts. Next Row [WS]: K2tog, k to end. Work in garter st until work measures 6[6.5, 7, 7.5, 8, 8.5, 9, 9.5] inches from beginning of armhole, ending with a WS row. Row 1 [RS]: BO 6[8, 8, 8, 10, 9, 12, 12] sts, k to end. 29[29, 35, 36, 36, 42, 43, 45] sts. Even-Numbered Rows 2-10	[WS]: K all sts. Row 3 [RS]: BO 4[4, 5, 5, 5, 6, 6, 6] sts, k to end. 25[25, 30, 31, 31, 36, 37, 39] sts. Row 5 [RS]: Work as for Row 3. 21[21, 25, 26, 26, 30, 31, 33] sts. Rows 7, 9, 11 [RS]: K2tog, k to end. Row 12 [WS]: BO 6[6, 7, 7, 7, 8, 8, 9] sts, k to end. 12[12, 15, 16, 16, 19, 20, 21] sts. Using larger neede, CO 41[41, 45, 45, 51, 51, 55, 55] sts. Work in garter st until work measures 6 inches, ending with a WS row. Next Row [RS]: K20[20, 22, 22, 25, 25, 27, 27], place marker, BO next st, k to end. Next Row [WS]: K20[20, 22, 22, 25, 25, 27, 27], place marker, CO 1 st using backward loop method, slip marker, k to end. 41[41, 45, 45, 51, 51, 55, 55] sts. St is dropped when sleeve is nearly complete; the markers at either side of the center st will ensure that you do not drop the wrong st! Continue in garter st until work measures 11[10, 10, 9, 9, 8, 8, 7] inches, ending with a WS row. Increase Row [RS]: K1, kfb, k to last 2 sts, kfb, k1. Repeat these 8 rows 4[6, 6, 8, 7, 9, 9, 11] times more. 51[55, 59, 63, 67, 71, 75, 79] sts. Continue in garter st until work measures 17[17, 17, 17.5, 17.5, 18, 18, 18] inches or desired length to underarm, ending with a WS row. BO 4[4, 4, 5, 5, 5, 6, 6] st at beginning of next 2 rows. 43[47, 51, 53, 57, 61, 63, 67] sts. BO 3 sts at beginning of next 2 rows. 37[41, 45, 47, 51, 55, 57, 61] sts. Next Row: BO 1 st, k to end. Repeat this row 19[15, 17, 9, 15, 19, 19, 23] times more. 17[25, 27, 37, 35, 35, 37, 37] sts. BO 2 st at beginning of next 0[2, 4, 6, 6, 2, 2, 0] rows. 17[21, 19, 25, 23, 31, 33, 37] sts. BO 3[3, 3, 4, 4, 7, 7, 8] sts at beginning of next row. Next Row [WS]: BO 3[3, 3, 4, 4, 7, 7, 8] sts, k to first marker, remove marker, drop/pick up next st, remove marker, k to end. BO remaining 11[15, 13, 17, 15, 17, 19, 21] sts. Block pieces to open up drop stitch pattern. Sew back to fronts at shoulders. Sew sleeves into armholes. Sew underarm sleeve seams. Using smaller needle and with RS facing, pick up and knit 17[17, 19, 21, 21, 23, 25, 27, 29] sts along right front neckline, 24[33, 34, 41, 49, 54, 56, 58] sts along back neckline, and 17[17, 19, 21, 21, 23, 25, 27, 29] sts along left front neckline. Work in garter st for 4.5 inches. BO all sts using larger needle. Sew on buttons to left front opposite buttonholes. Weave in ends. If desired, steam block seams to help them lay flat. Weaverknits was born as a collaboration of two sisters who have been making things since they were born. Beth, an interior designer, helps brainstorm design inspiration and ideas; Ann, an Indie Rock Secretary extensively trained in art and Assyriology, knits them into being. The other members of the Weaver family serve as models, photographers, and consultants. You can read more about it all on Ann’s blog.